Friday marks another historic day in the long battle to dismantle the NCAA. 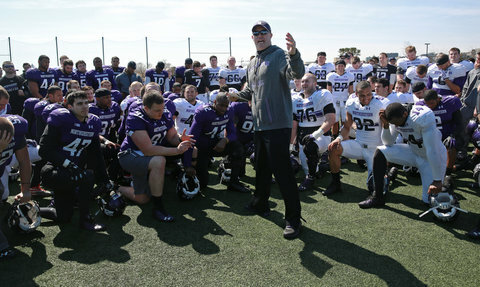 After National Labor Relations Board Regional Director Peter Sung Ohr declared Northwestern University football players as employees, not “student-athletes” last month, the team won the right to unionize. Although several levels of appeals surely await, the Wildcats will vote on April 25 whether or not to form a union. The vote will take place inside Welsh-Ryan Arena and is likely to be kept highly secret as the university has already banned the media from the arena. There are 76 players eligible to vote, although not all are required to do so. For the College Athletes Players Association, or CAPA, to bargain on behalf of the players, a simple majority of the football players voting would have to side with the union. 1. 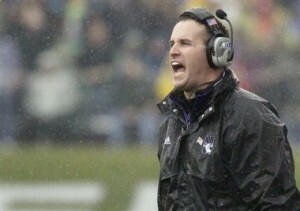 Pat Fitzgerald is vindictive and holds grudges. Yes, I’m leading off with a bit of a personal attack, but I believe the Wildcats’ fiery head coach is the top reason why a union will never take hold in Evanston. Coach Fitzgerald is, quite admirably, a stickler for the rules. He has no problem benching players who skip meetings, goof off in class, or commit off-the-field transgressions. Unlike his peers at other Big Ten schools that look the other way when star players assault women (I’m looking at you Ohio State), Coach Fitzgerald sticks to his morals. When it comes to unionizing, Coach Fitzgerald is more anti-union than a Wisconsin Republican. I have no doubt that he would bench a player who voted “yes” on unionizing. Granted, the votes are secret and punitive retribution is illegal, but don’t doubt that if Fitzgerald doesn’t want a union, he’ll go to any lengths to make sure it doesn’t happen. Now this might seem speculative, and it is, but here is why I would fear Fitzgerald if I had a vote to cast. In 2006, Fitzgerald suddenly and unexpectedly became head coach when Randy Walker died of a heart attack. I had the opportunity to cover the Wildcats and travel with the team for the Daily Northwestern. The team was struggling and ultimately finished 4-8. It was the type of season where a leader’s true colors shine brightly and also the season where Fitzgerald banned me from practice for a week. Late in the season, the 2-7 Wildcats were preparing for a trip to Iowa. The team had a rotating cast of quarterbacks all season as no candidate seemed capable of taking the reins. I was watching practice when I noticed that one of the quarterbacks, Andrew Brewer, was nowhere to be found. I soon realized that Brewer was wearing a different jersey number and was practicing with the receivers. After practiced I asked Fitzgerald if his quarterback was now going to play receiver. His responded with, “I don’t want the boys in Iowa to know what’s going on, so I’m not going to talk about it and neither should you.” That type of answer is a pure adrenaline rush for a journalist. I quickly found Brewer and asked him directly if he was going to switch to receiver and he confirmed that he was. I ran with the story. The day the story came out, my editors received a call from the Northwestern athletic department informing me that I was banned from attending practice for the rest of the week. Seriously, a student report got under Fitzgerald’s skin so much that he made a policy of banning me from practice. After the Iowa game, which NU won, Fitzgerald refused to answer my questions or look at me for the rest of the season. This was a Big Ten head football coach making six figures who was holding a grudge against a 20-year-old student reporter. Don’t think for one second that he won’t do the same when it comes to this union vote. Fitzgerald is a volatile person and that locker room will be miserable if the players vote to form a union. NU quarterback Trevor Siemian is the leader of the anti-union movement in the Wildcats' locker room. 2. The quarterback is anti-union. The successor to union organizer Kain Colter, is senior Trevor Siemian. Siemian has been very vocal recently about his opposition to forming a union. His opposition holds a lot of sway. Northwestern runs the spread offense. They throw nearly 50 passes per game. If you’re a receiver this type of offense is a gold mine. However, if some receivers vote “yes” on the union and some vote “no” who do you think Siemian is going to distribute the ball to first? It is never wise at any level to cross a quarterback. I imagine everyone on the Wildcats’ offense is well aware of Siemian’s views on the union. His public statements are all he needs to say to get his point across in that locker room. 3. Wildcat alums are anti-union. Unless a player is lucky enough to go to the NFL, most Wildcats end up in graduate school or the work force once their playing days are over. This is where the Northwestern alumni network is so valuable. NU athletes tend to land incredible jobs after graduation due to the influence of the Big Ten’s brightest football alums. I mean, they aren’t exactly known for gridiron success. However, some alums, like former defensive back Kevin Brown, have been quite outspoken that job opportunities for current players would dry up if they vote to unionize. Such threats are not taken lightly by seniors about to graduate into a difficult economy. 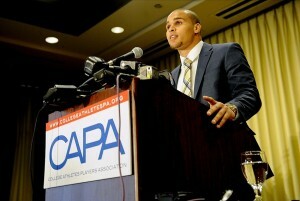 Former NU quarterback Kain Colter was the catalyst for unionizing with CAPA's help. 4. Kain Colter is no longer on campus. Colter is undeniably the face of the athlete unionization movement. He first made headlines wearing the “All Players United” wristbands and then led the move toward unionizing with CAPA. Colter was a strong leader on the field and in the locker room and he personally gathered the support of his teammates to move forward with the NLRB case. Now that Colter has graduated, there has not been a single player to stand up in support of the union and confront the coaches and university like Colter did. Without such a strong leader, I envision the union movement falling apart. 5. A number of players will take the “wait and see” approach. The results of Friday’s election will remain secret until the NLRB makes a final decision on the appeal. The players are smart enough to know that the issue of unionization will be determined by the judicial system. Accordingly, some players will choose to let this matter play out in the courts rather than rock the boat by voting “yes.” If the team votes to unionize, but CAPA loses on appeal, then the vote becomes largely meaningless while the players will have to deal with the fallout from voting to unionize. Ultimately, the players are in a difficult situation. Everyone agrees that the NCAA must enact major reforms to treat players more fairly. However, there is a sharp divide as to whether unionizing is the right move or not. The consequences of unionizing are vast and largely unknown at this point. On Friday, the players would have to take a giant leap of faith that not only would their union survive a judicial challenge, but that they will not have to deal with any push back in the locker room and on the field. The election on Friday is certainly a milestone for players seeking better treatment from one of the most profitable “non-profits” in the nation. However, if I were in Vegas, I’d put my money on a “no” vote.